App analytics firm Umeng, typically known as the ‘Flurry of China,’ has released a new report that provides more evidence of the burgeoning smartphone market in China, which is already known as the world’s largest. 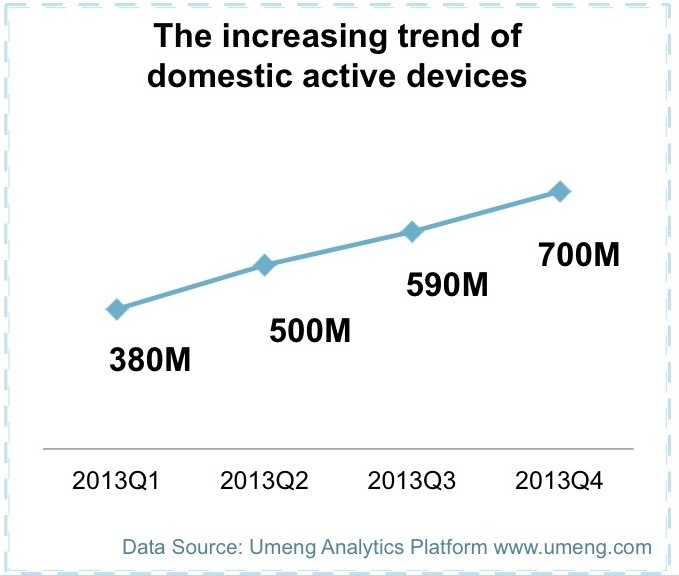 The number of active smart devices in China — including smartphones and tablets — exceeded 700 million by the end of 2013. This is a marked increase throughout the year — in the first quarter of 2013, the number of devices numbered only 380 million. 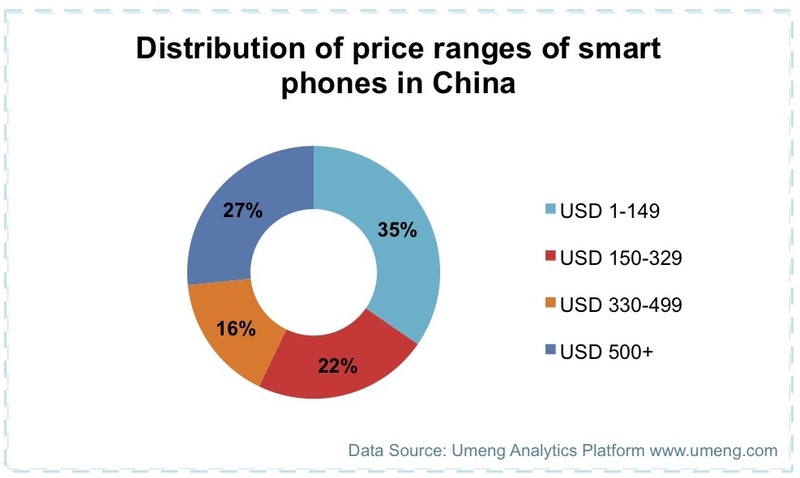 Chinese consumers have typically been known for favoring low-cost Android smartphones — and indeed, Umeng notes that the market for budget Android phones is strong, as 57 percent of devices came in under the $330 price range. However, high-end devices costing upwards of $500 also have a significant market share in China, contributing 27 percent of the total, and 80 percent of them are iPhones. Over the course of 2013, Umeng also found that the percentage of iOS jailbroken devices in China fell from 30 percent of all devices at the start of the year, to 13 percent at the end of the year, as domestic users became more hesitant to jailbreak their devices. As for Android smartphone brands, Umeng found that in the fourth quarter of 2013, all of the top 10 Android devices were manufactured between Samsung and Chinese smartphone manufacturer Xiaomi — proving their popularity in the Chinese market. However, it notes that the Android smartphone market is still highly fragmented with “hundreds” of different handsets available for purchase. In terms of app usage, Umeng notes that users of high-end devices have “dynamic needs” on mobile apps — favoring apps for news, navigation, finance and e-commerce — while those with phones priced below $150 tend to use their devices for entertainment needs, so casual games and theme or wallpaper apps are more popular. 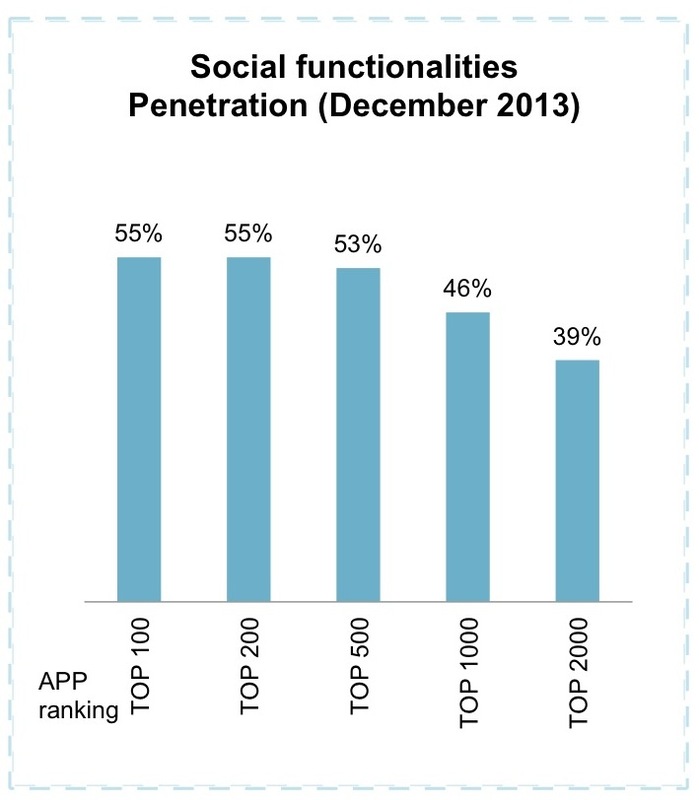 Overall though, social networking was a key theme of apps throughout last year. Umeng notes that in 2013, app users became more interested in sharing on social networking platforms. Among the top 1,000 apps in the Chinese market, including games, 55 percent of them provided links to Chinese social networking sites including microblogging platform Sina Weibo, messaging service WeChat and IM product mobile QQ. Meanwhile, the amount of app content sharing to social network platforms per mobile Internet user per day tripled in the last six months of 2013. Games were a key driver of this growth — 48 percent of in-app sharing traffic to social networks came from games. Umeng’s largely positive growth report comes as an IDC report last month sounded a note of caution as China posted its first decrease in smartphone shipments in more than two years during the last three months of 2013. IDC noted that the dynamic is shifting in China — rising smartphone adoption means many people already own a device, presenting a different sales challenge for OEMs and operators — but expressed bullishness that the market is still not tapped out, and will continue to grow in the future.